At the U.S. Navy's Pacific Missile Range Facility in Kauai, Hawaii, NASA's Low-Density Supersonic Decelerator (LDSD) project team awaits their next possible launch window. NASA's self-proclaimed "flying saucer" just can't seem to get off the ground, and it's all Mother Nature's fault. 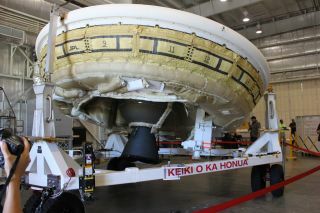 For the fifth time in a row, bad weather over the mission's launching site at U.S. Navy Pacific Missile Range Facility in Kauai, Hawaii, has prevented a balloon carrying the inflatable saucer-like spacecraft landing system prototype - called the Low-Density Supersonic Decelerator, or LDSD for short - to its launch altitude. "Due to weather conditions, there will be no launch of the LDSD test vehicle on Wednesday, June 11. The next potential launch date is Saturday, June 14," NASA officials wrote in the update. The Saturday launch window is expected to open at around 11:15 a.m. EDT (8:15 a.m. Hawaii Time). It is the last pre-planned launch option for the mission now that bad weather spoiled launch tries for June 3, 5, 7, 9 and 11. The LDSD is an inflatable re-entry vehicle designed to help slow down large payloads, such as an astronaut habitat or other huge spacecraft, to allow a safe landing on the Martian surface. It is one of three concepts (two of them based on inflatable technology) that NASA is studying to land larger payloads on Mars. The LDSD mission will launch a huge balloon that will carry the prototype into the stratosphere. The LDSD vehicle will then separate from the balloon, ignite a solid-fueled booster rocket to reach re-entry speeds and then attempt to deploy the inflatable decelerator parachute. If all goes well, the vehicle will splash down in the ocean to be retrieved by a recovery team.